There are two theories that audio manufacturers follow regarding upgrading and renaming their products. Some rename products with every slight change, often creating model designations that are thick with Roman-numeral suffixes. Other manufacturers perform updates on the fly, retaining the original product name until the changes are so profound that a new one is warranted. Essential Sound Products belongs to this second group of manufacturers. The company's flagship and best-selling product, The Essence power cord, went through five iterations over the course of almost a decade without any fanfare. I wrote about The Essence back in 1999, a short time after the cord's "one major upgrade that incorporated design refinements and a thorough enhancement of materials and the manufacturing process." "Common wisdom is that there are fewer grain boundaries after cryogenic treatment. In fact, there may be more boundaries. What cryogenic treatment does is create such internal pressure that grains realign for better surface-to-surface contact. Any spacing between grain boundaries is significantly reduced. Even in high-purity copper, this compacting can occur hundreds of times per inch length of copper wire. Bottom line, electrically, is that cryogenic treatment has close to the same effect as if it were eliminating grain boundaries altogether -- lower resistance, and more current with fewer distortion effects due to the grain boundaries." The Essence Reference costs $649 USD per two-meter length, a jump of $150 over the price of the cord I reviewed six years ago. 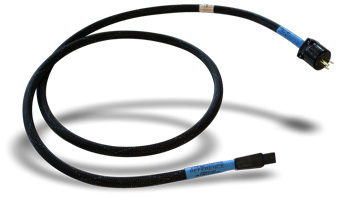 Physically, the new cord has a slightly smaller diameter than The Essence, but it retains the earlier model's hermetically sealed IEC connector and plug. The two cords look similar but not identical, due to slight changes in their outer mesh sleeves, labeling, and serial-number graphics. Even their packaging, in a zippered cloth bag, is slightly different -- the new bag is a brighter silver. What hasn't changed is the way the plug tines are protected with soft nubs, which former SoundStage! writer Jim Causey called "plug condoms." It fits! ESP has an interesting approach to break-in of its products, proclaiming that not only do its power cords break in, but so do the components with which they are used. "The power supply of the component (mostly the capacitors) that you attach the cord to undergoes additional break-in due to the enhanced dynamic capabilities afforded by The Essence Reference." Furthermore, according to Michael Griffin, switching equipment off causes capacitors to slowly return to their pre-The Essence Reference state, which implies that part of the break-in process has to take place again and again, each time you turn your equipment on. Bummer. However, Michael explained that "slowly" means "over the course of days to a couple weeks," so you may avoid re-break-in if you use your system regularly. There was no way I could test the claim that The Essence Reference breaks in capacitors, but ESP did send me enough cords to outfit my entire system and thereby test their effects thoroughly. I did hear some oddities, including a general plodding darkness along with some highlighting in the extreme treble, when I first put in The Essence Reference cords. Anyone who doesn't believe that power cords can make a sonic difference, let alone doubts that break-in exists, should hear some of these cords with no time on them. The darkness was definitely more recognizable than the highlighting, perhaps because it was the dominant characteristic early on. I remembered that the original The Essence had a burnished sweetness to its sound, and it worked best with solid-state gear, so I hoped from the very beginning that the new cords hadn't moved even further in this sonic direction in the ensuing years. Happily, the issues I mentioned subsided in relatively short order -- after 100 hours or so of use -- and, more important, I didn't notice that they came back if I shut my system down. Hallelujah! With some time on them, The Essence References were not power cords that I would recommend with only solid state (or tubes) or even one type of component. To some ears there will still be a slightly enriched tonality. However, I know from experience that the sound most audiophiles identify as neutral is actually more lean and austere than reality. Used in my system, The Essence Reference cords were exceedingly close to real neutrality, and close to what I hear from Lamm electronics and Wilson Audio speakers, for instance: performance without obvious limitations -- completeness. Perhaps the most difficult kind of recording to reproduce convincingly is of a solo piano played in a spacious hall. There are no other instruments to obscure the piano, so it draws great attention, and the space of the recording seems all the more obvious because there is only a piano making music. Does this make Duo Campion-Vachon's Duke Ellington [Analekta AN 2 9820] doubly difficult to reproduce? It is a recording of four-handed piano, and its slight dryness makes for a somewhat stark presentation. The music is wonderful -- 17 Duke Ellington numbers played in a soft, swinging way. A warm-sounding system misses much of the space, and a lean-sounding system doesn't convey the impact and density of the piano. The Essence Reference cords helped my system capture it all, so well did they blend with the rest of the components -- a notable feat, given the equipment with which they were used: Wilson Audio Alexandria X-2 speakers, Lamm M1.2 Reference amps, Audio Research Reference 3 preamp, Zanden Audio Model 2000 Premium/Model 5000 Signature transport/DAC combo. The Essence Reference betters a couple of the Shunyata Research power cords I've been using for the past few years, namely the Taipan and Python, which, to be fair, I haven't used in their Vx and Alpha forms, let alone the newest Helix iterations. These two power cords offset each other in many sonic ways, the Taipan sounding powerful and lively, the Python rich and present. The Essence Reference is far more uniform, and neutral, in its presentation, making it suitable for use with a wide array of components. I wonder, in fact, if there are any systems in which it won't sound terrific, so unassuming and transparent are its contributions. Michael Griffin has let me know that a Reference version of his The Essence power distributor is imminent and will bulk out the ESP line of power products. 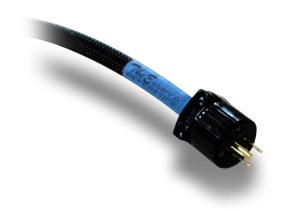 The Essence Reference proved to be an all-purpose power cord, and its price is at the low end when compared to other companies' statement cords. No matter the cost or pedigree of your audio system, you should try The Essence Reference. Price: $649 per two-meter length.